"We’re happy to announce Ratchet & Clank: Full Frontal Assault will be available on November 27th on the PlayStation Store and at retail. That’s right, you asked and we listened: Full Frontal Assault will be available as a retail copy for those of you who love physical copies of your games! 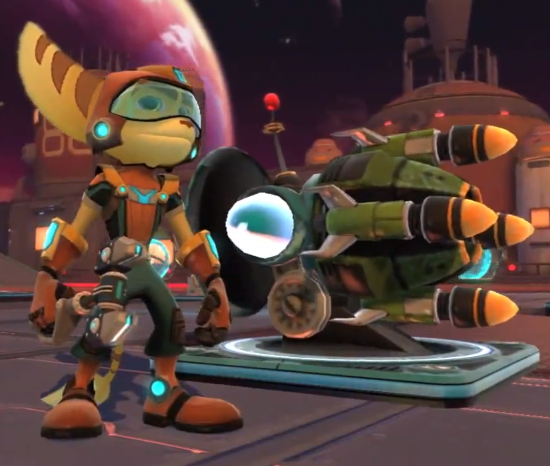 Both the download and retail versions support cross-buy as well, so your purchase gets you both the game on PS3 and a digital copy for PlayStation Vita"
The other big question we’ve gotten a lot is “How much will the game cost?” As you know, Full Frontal Assault is a “fun-size” project that’s similar in scope to Ratchet & Clank Future: Quest for Booty. But Full Frontal is actually bigger than Booty (sorry, couldn’t resist), as we’ve added tons of new features, including the new base assault and defense elements. An even bigger addition to Full Frontal Assault is the replay value we packed in with online / split-screen co-op, and online competitive modes. Most importantly, while the experience itself may be more condensed, the game quality is bursting at the seams. We’re very proud of what we’ve created.As such, we’re especially excited to announce that Full Frontal Assault is launching for just $19.99. Considering you get a brand-new Ratchet & Clank game for your PS3 and PS Vita, with cross-save and cross-play support for the game’s co-op and competitive multiplayer, it’s a deal that’s hard to refuse. Will you buy Rachet & Clank? Let us know your thoughts in the comments below!